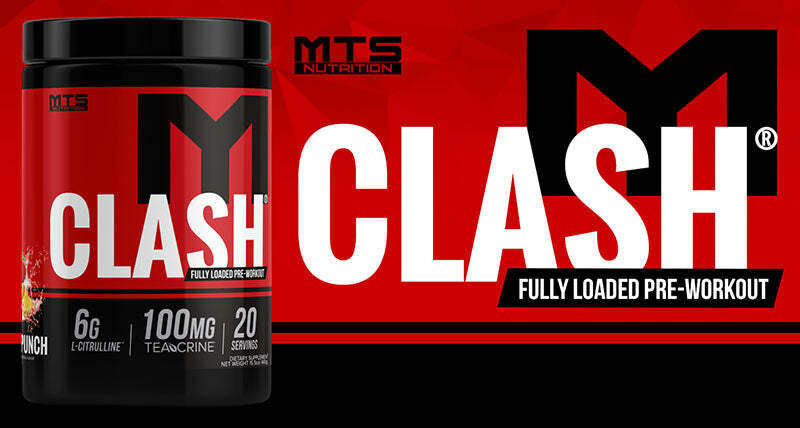 MTS Nutrition CLASH is where performance and improved body composition “CLASH”! CLASH combines research-proven ingredients in a scientifically-validated, FULLY-DISCLOSED formula. It will not only propel you through the most grueling workouts, but also ensure you have all the ergogenic support you need to help build lean muscle and lose fat. When in the gym, many individuals strive for an intense pump. The kind where it feels like your skin is going to tear. L-Citrulline can help you achieve such a pump. L-Citrulline has the ability to increase nitric oxide production, allowing your blood vessels to expand and dilate. This ingredient in itself has many benefits such as aiding in shuttling nutrients to the working muscles, promoting healthy energy levels, and improving blood flow. In addition, L-Citrulline can help prevent inflammation and muscle wasting due to oxidative stress (Ham et al., 2015). Supplementing with this ingredient has been proven to be safe and has also been used by patients suffering from erectile dysfunction as an alternative treatment method (Cormio et al., 2011). Creapure Creatine Monohydrate is known for its high quality and purity. Creatine (in general) is the most researched dietary supplement and ergogenic aid available on the market today. With hundreds of studies to back its effectiveness, many add this to their supplement regimen to give them greater performance during their workouts and quicker recovery time. Creatine also helps with building lean muscle mass (Tarnopolsky et al., 2008). In order to progress and see continued results, you need to consistently challenge your muscles. Creatine is capable of providing the working muscles with energy to allow you to push harder in the gym, all while helping to reduce muscle fatigue. It doesn’t just stop there. If creatine is added to a solid training protocol, individuals have the ability to improve their overall strength and body composition (Galvan et al., 2016). With over 55 studies on Carnosyn Beta Alanine, it’s hard to not want to add it to your arsenal of supplements. When muscle growth and strength are your goals, this is a must have ingredient in your formulation. Carnosyn has been shown to not only improve recovery time and muscle endurance (Smith et al., 2009), but also delay fatigue to allow you to push harder every workout (Derave et al., 2007). As a result of being able to increase your workload each workout, you can notice significant increases in overall muscle strength (Hoffman et al., 2006). Carnosyn Beta Alanine is so potent and beneficial, that it has been granted 14 global patents as a result. Better Training Sessions with Better Results. Betaine Anhydrous, also known as trimethylglycine (TMG), is a component of beetroot. Supplementing with Betaine can help improve vasodilation by increasing nitric oxide levels in the blood (Iqbal et al., 2006). This can aid in providing a pump during exercise, as well as improving blood flow and nutrient transport. Betaine is also able to help improve endurance where more work is able to be completed prior to fatigue (Trepanowski et al., 2011). Additionally, when it comes to overall muscle growth and size, Betaine is able to support growth hormone levels by increasing IGF-1 in the body and was also found to reduce cortisol levels (Apicella et al., 2013). Familiar with L-Arginine? It’s used in many pre-workout products to aid in providing a pump/vasodilation. Agmatine, is a metabolite of L-Arginine and has many benefits which is why you can find Agmatine in many pre-workouts as well as nootropic supplements. Agmatine is great for mental functioning such as mental health, stress management, and mental clarity (Examine). Agmatine has the ability to aid in increasing insulin response which can improve body composition (Hwang et al., 2005). With the help of Agmatine, you can reduce perceived pain, allowing you to push harder and longer during workouts (Keynan et al., 2010). In order to build quality lean muscle mass, you also need to increase protein synthesis while shuttling nutrients to the muscles to help them rebuild and recover. Agmatine aids in regulating nitric oxide synthase to help produce nitric oxide which can then cause a vasodilation effect of the blood vessels to help transport nutrients throughout the body and into working muscles (Biolo, 1997). Another key benefit of Agmatine is it’s potential to affect testosterone levels. When there is a higher level of testosterone present, it primes the body to build muscle. Agmatine can also increase the secretion of luteinizing hormone, which is vital in testosterone production (Kalra et al., 1995). N-Acetyl-L-Tyrosine is a more soluble form of the non-essential amino acid Tyrosine. N-Acetyl-L-Tyrosine can help with mental focus and cognitive function by increasing the levels of norepinephrine. This leads to better focus and mindset for the most intense training sessions. One ingredient you will find in many pre-workouts on the market today is caffeine. This particular ingredient has been used to improve performance for more than 15 years – helping give athletes and the general population alike, the ability to improve their performance and increase their energy levels. While the dosages vary and are dependent on the individuals’ tolerance to simulants, the overall consensus is that caffeine can improve reaction time, logical reasoning, and vigilance (Kamimori et al., 2015). In addition, researchers have found that caffeine can also aid in enhancing long-term memory (Borota et al., 2014). A hot new ingredient that is finding its way into pre-workouts is Teacrine and for good reason – it works. Teacrine is a great sustainable energy booster that doesn’t cause irritability, jitters, or the normal crash associated with many stimulants. Some other benefits to supplementing with Teacrine is its ability to heighten mental focus, improve mood, enhance motivation, and improves focus and concentration (Teacrine). Combine all of these benefits into one product and you have a powerhouse that has the ability to take your workouts to the next level. Theobromine is commonly found in chocolate (cacao). The energy boost you get from chocolate is actually coming from Theobromine itself – dark chocolate having the highest concentrations. Along with the energy boost, expect to feel nootropic effects where you attain a feeling of relaxation (Mitchell et al., 2011). Due to the vasodilation properties found in Theobromine (Martinez-Pinilla et al., 2015), it can also help attain a pump during workouts. The dilation of blood vessels can help increase blood flow to working muscles as well as transport nutrients more easily throughout the body. In addition, Theobromine has a diuretic effect, pulling water out of the body (Eteng et al., 2006). Lastly, as an added bonus, Theobromine may help with weight reduction as well thanks to its ability to reduce hunger and help prevent overeating (Khazan et al., 2014). This specifically formulated version of caffeine (di-caffeine malate) is an ionic bond of caffeine and malic acid which can increase mental focus and energy (Infinergy). In addition, Infinergy increases thermogenesis which can aid in weight loss. With this addition to any pre-workout and you can not only attain the energy needed to grind through the most grueling workout, but it can also help you burn fat and drop unwanted body weight. N-Methyl-L-Tyramine HCl (or NMT) is a great ingredient to add to any formula to enhance energy levels by utilizing fat and breaking it down into a usable energy source (Stohs et al., 2015). To enhance the effects from NMT, caffeine can be added to make the ingredient more potent. When placed in a pre-workout containing caffeine, N-Methyl-L-Tyramine HCl can help fuel intense workouts and send energy levels into orbit. Closely related to tyramine, Hordenine HCl can help enhance muscular contractions (Barwell et al., 1989). This allows you to have intense contractions during resistance training, breaking down muscle fibers to be rebuilt stronger and larger. Hordenine HCl also has nootropic properties that can enhance mood and focus (Fisar et al., 2010). With Hordenine HCl’s ability to effect the adrenergic system, you can also find an increase in energy by boosting norepinephrine levels. In addition, supplementing with Hordenine HCl can aid in weight loss through increasing metabolism. 1. Apicella JM, et al. “Betaine supplementation enhances anabolic endocrine and Akt signaling in response to acute bouts of exercise.” Eur J Appl Physiol. 2013. 2. Barwell CJ, et al. “Deamination of hordenine by monoamine oxidase and its action on vasa deferentia of the rat.” J Pharm Pharmacol. 1989. 5. Cormio, L., De Siati, M., Lorusso, F., Selvaggio, O., Mirabella, L., Sanguedolce, F., & Carrieri, G. “Oral L-citrulline supplementation improves erection hardness in men with mild erectile dysfunction.” Urology, 77(1), 119-141. 2011. 9. Fisar, Z, et al., “Inhibition of monoamine oxidase activity by antidepressants and mood stabilizers.”, Neuro Endocrinol Lett. 31(5):645-56. 2010. 10. Galvan, E., Walker, D. K., Simbo, S. Y., Dalton, R., Levers, K., O’Connor, A, . . . Kreider, R. “Acute and chronic safety and efficacy of dose dependent creatine nitrate supplementation and exercise performance.” Journal of International Society of Sports Nutrition, 13, 1-24. 2016. 13. Hwang SL, et al. “Activation of imidazoline receptors in adrenal gland to lower plasma glucose in streptozotocin-induced diabetic rats.” Diabetologia. 2005. 18. Keynan O, et al. “Safety and Efficacy of Dietary Agmatine Sulfate in Lumbar Disc-associated Radiculopathy. An Open-label, Dose-escalating Study Followed by a Randomized, Double-blind, Placebo-controlled Trial.” Pain Med. 2010. 22. Neri DF, et al. “The effects of tyrosine on cognitive performance during extended wakefulness.” Aviat Space Environ Med. 1995. 23. Smith A E, et al. “Effects of beta-alanine supplementation and high level intensity interval training on endurance performance and body composition in men—a double-blind trial.” J Int Soc Sports Nutr., 6: 5. 2009. 24. Stohs, S J, and M J Hartman. “A Review of the Receptor Binding and Pharmacological Effects of N-Methyltyramine.” Phytotherapy Research: PTR., U.S. National Library of Medicine, Jan. 2015. 25. Tarnopolsky, M., & Safdar, A. “The potential benefits of creatine and conjugated linoleic acid as adjuncts to resistance training in older adults.” Applied Physiology, Nutrition & Metabolism, 33 (1), 213-227. 2008. 27. Trepanowski JF, et al. “The effects of chronic betaine supplementation on exercise performance, skeletal muscle oxygen saturation and associated biochemical parameters in resistance trained men.” J Strength Cond Res. 2011.